I don’t mean which lake do you like to go to or to what river or stream. I mean where do you actually go if you want to catch fish? The answer, of course, is water. When fish are caught, it is safe to say they are removed from their previous environment. Everything they have known before changes. A new world of non-water is suddenly around them, and unless they are caught to be in a zoo or home aquarium, it is the end of their life. 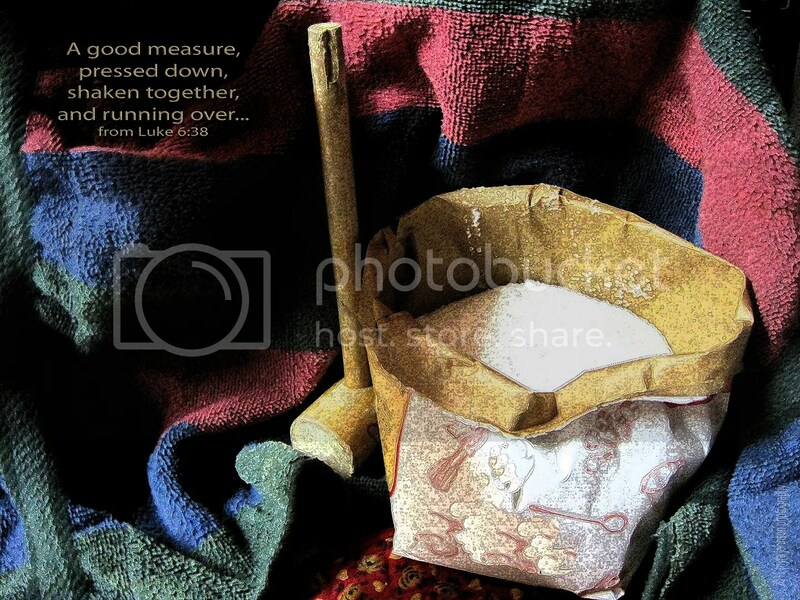 Jesus told Peter and Andrew that He would teach them to fish for people–they would become "fishers of men." Where do you go to catch people? The answer, of course, is wherever they are. Where they are existing without the saving knowledge of God. Where they are exisitng without a relationship with Him. When people are "caught" for the kingdom of God, it is safe to say that they are removed from their previous environment. A new world of forgiveness from sin is suddenly around them. Unlike fish, however, it is not the end of their lives—it is the beginning of an eternal one with God. Unlike fish, when people are "caught" by God, they finally become free. Instead of packing a fishing pole, you and I are to pray for those who have not believed. Instead of attaching hooks to line, we are to live our own lives in such a way as to give testimony of the love and forgiveness of God. Instead of using lures or worms as bait, we are to share with others how they could know Jesus as their Savior. Because Jesus died on the cross and rose again, we have hope. We have hope to live a life in fellowship with Him right now. We have hope to live a life in fellowship with Him when we die, because He will take us to be with Him. We have hope that goodbyes on this earth are not final for those who trust in Him. Because Jesus died on the cross and rose again, we know that, "Surely He was the Son of God!" The graduation was held at a pleasant time of day. The sun was just setting and the evening had a sweet coolness that settled in with the dusk. I attended the ceremony several weeks ago. "Come and bring the best of who you are to what Jesus is all about." I have been seriously pondering thoughts that relate to this statement. What exactly is the best of who I am? What strengths and gifts has God given me? Am I bringing my best to Jesus? If Jesus is about serving others, am I bringing the best of who I am to serving others in His Name? If Jesus is about mercy, am I bringing the best of who I am in showing mercy? If Jesus is about love, am I bringing the best of who I am in loving? Then Jesus directed them to have all the people sit down in groups on the green grass. So they sat down in groups of hundreds and fifties. Taking the five loaves and the two fish and looking up to heaven, he gave thanks and broke the loaves. 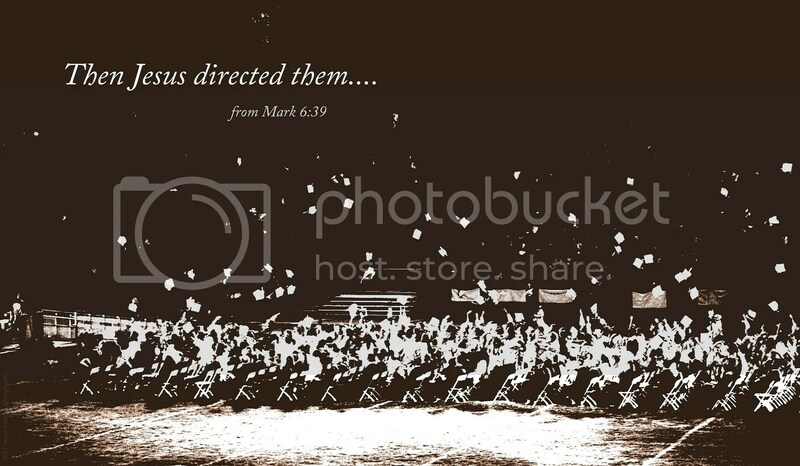 Then he gave them to his disciples to distribute to the people. He also divided the two fish among them all. At the graduation I attended, many of the students had given of themselves for years to the task of academic excellence, each bringing the best of who they were and receiving guidance in return. Throwing their caps into the air at the completion of the ceremony, they marked a specific beginning of going out and doing what they were equipped for. They had been given direction; now, it was time to act. Jesus took the best of what had been given to Him and He directed His disciples to carry out the task. 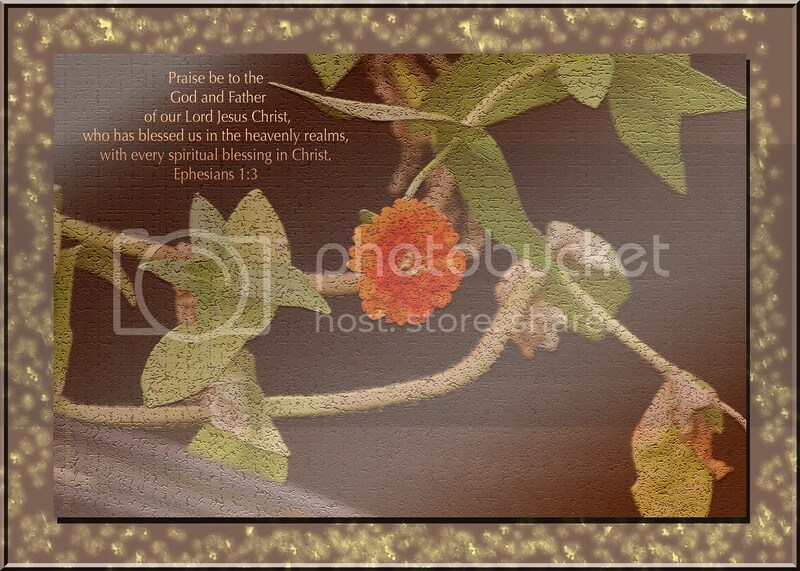 Jesus provided the increase of the food; the disciples took the food and gave it to the people. I have been given direction. Now, it is time to act…. Am I bringing the best of who I am to what Jesus is all about? 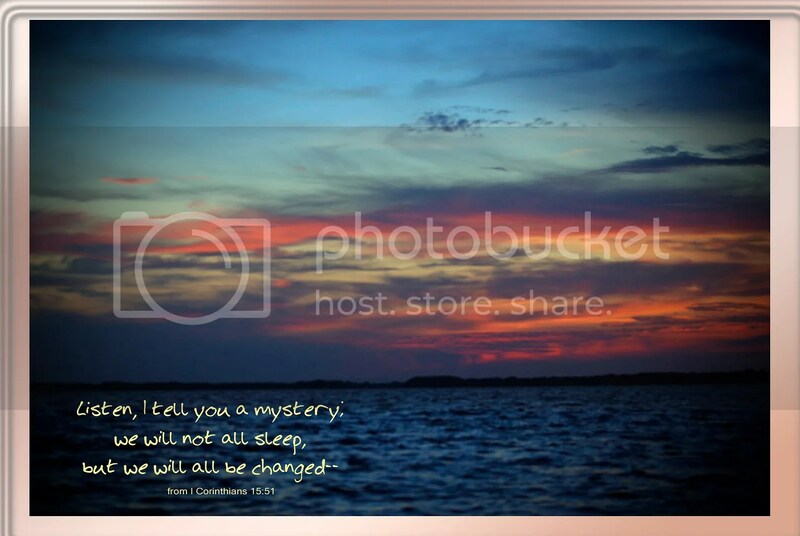 It was a one day retreat located at a lakeside camp. I was looking forward to attending, not knowing exactly what it would be like. The first few hours had gone well. Without prior notice, we were told to get in our cars and drive to another area of the camp for the next activity. We arrived at an intricately designed prayer labyrinth. 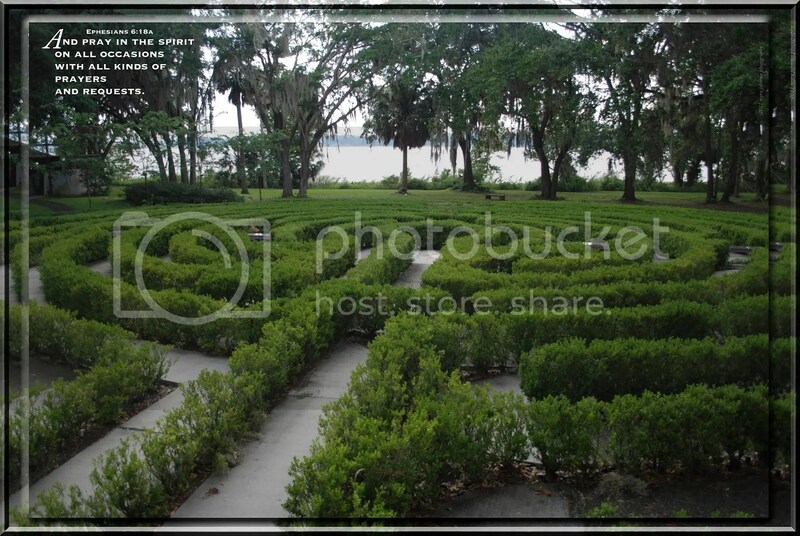 Manicured bushes lined the winding pathways near the spanish moss that gently swayed in the breeze. The lake was just a short distance away. Dark clouds hinting at rain moved slowly overhead. We were given a half-sheet of paper with instructions about praying as we entered the labyrinth, along with suggestions for prayer when we reached its center and began our way out. It was a very moving experience. 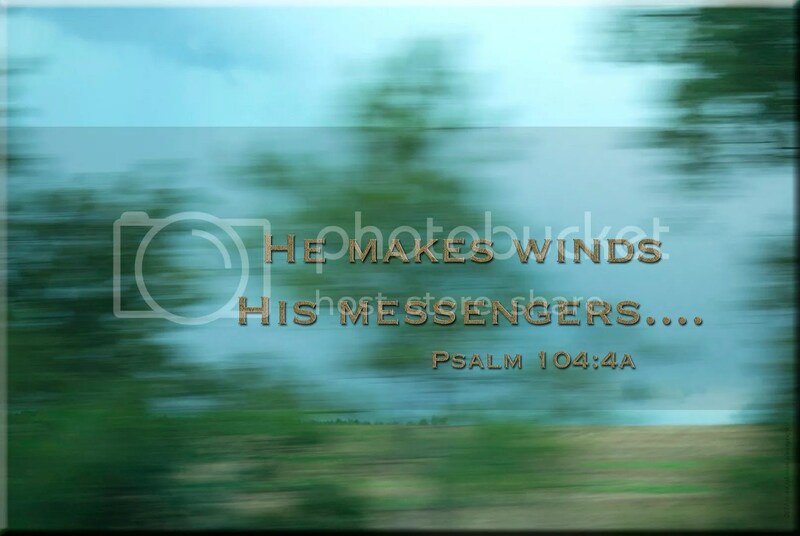 The wind was an almost constant companion throughout the journey. I began to think about the Spirit of God blowing on us. As I completed the path and emerged in an area close to the entrance, I was unsure as to how many minutes had elapsed. I had spoken to God about several things; I felt that He was there. Take the helmet of salvation and the sword of the Spirit, which is the word of God. And pray in the Spirit on all occasions with all kinds of prayers and requests. With this in mind, be alert and always keep on praying for all the Lord’s people. If you haven’t already done so, take some time to speak to God today. He is there, ready to listen. Be ready to listen to Him, too. During the past several days I have witnessed the unfolding of God’s work in someone’s life. When God works things out, it can be in such a way that we could never have imagined. It’s sort of like this….. If you prayed for the funds to repair your car and someone gives you a practically new one. If you prayed for the chance to get an entry level job at a company and you are hired in a management position right away. If you prayed that your mission group would have a canoe to take supplies across the river and a villager comes with a large boat to transport all you have. The examples of God’s faithfulness are endless, because His faithfulness is never ending. Being present to see this once again with my own eyes, my heart is filled with joy over the blessing of another. Hasn’t this been true in your life? We we driving along the ocean front when I saw the Ferris wheel. What a great place to mount such a thing! Looking west, a rider could view tall buildings, farms, city streets. Looking east, the vast ocean and coast line would be in full view. Reaching the very top, one could see the most. Things not visible from the ground would now be seen. When we come to know God, our perspective changes, doesn’t it? Attitudes we once held give way to new insights as we begin to see things His way. 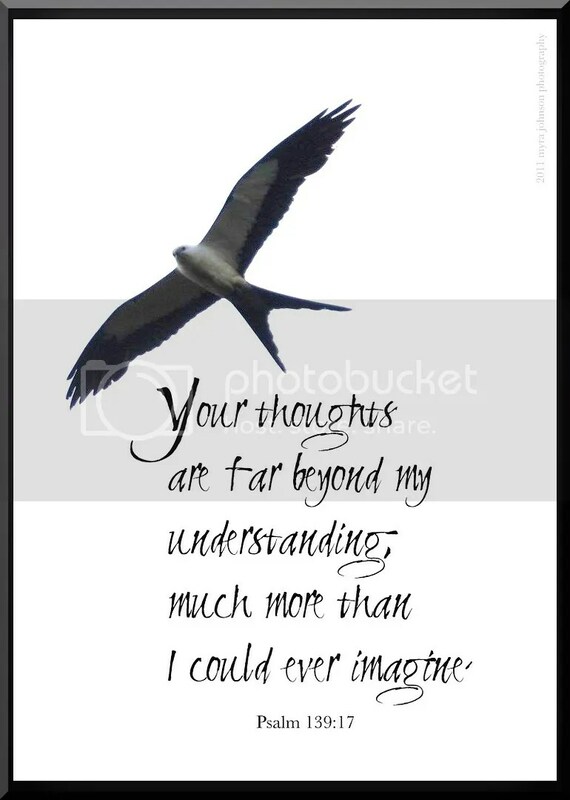 Certain and sure that things are what they are from our vantage point on the ground of our old life, we change our minds as we are lifted high above our own thoughts to percieve what an all-knowing Father is showing us. 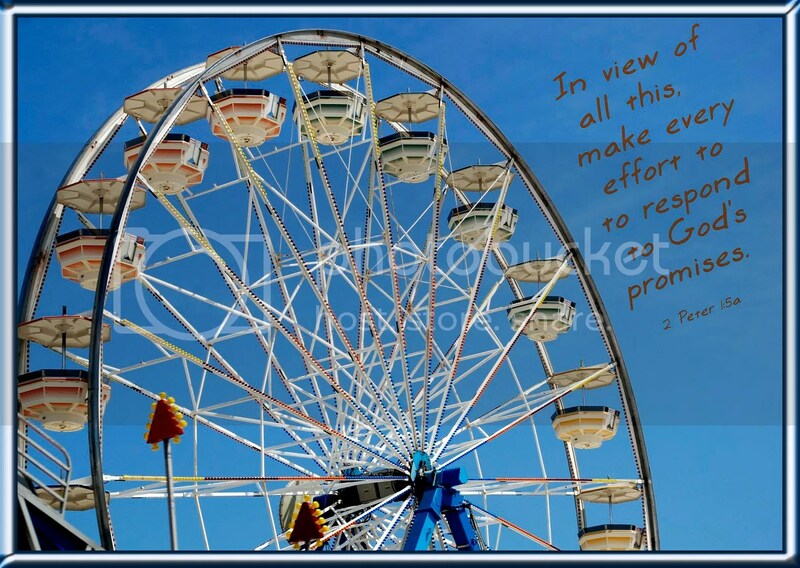 With this high reaching view of what God has done, our desires begin to fall in line with what God wants us to be. What would it be like if we could hear lonliness? What if the feeling of being disconnected could make a sound? What if the silent cries of a broken heart could vibrate and reach the ears of those nearby? If we could hear the sounds of people feeling lonely, unloved or unimportant, it would be deafening. In fact, I think it would drown out traffic noise in the city streets. It would be louder than the music booming from a neighborhood tavern. It would be more distinct than the voices from countless televisions. So great would be the sound that it could not be ignored. But can’t we hear it, really? Can we not percieve the "sound" it creates? In the five star hotel. In the million dollar home. What does God want us to do when we hear the sounds? We can show compassion and love toward those who are hurting. We can point them toward the wisdom of knowing God and living for Him. We know that there is a life worth living, a meaningful life set apart with purpose. Lady Wisdom has built and furnished her home; it’s supported by seven hewn timbers. The banquet meal is ready to be served: lamb roasted, wine poured out, table set with silver and flowers. Having dismissed her serving maids, Lady Wisdom goes to town, stands in a prominent place, and invites everyone within sound of her voice: "Are you confused about life, don’t know what’s going on? Come with me, oh come, have dinner with me! I’ve prepared a wonderful spread—fresh-baked bread, roast lamb, carefully selected wines. Leave your impoverished confusion and live! 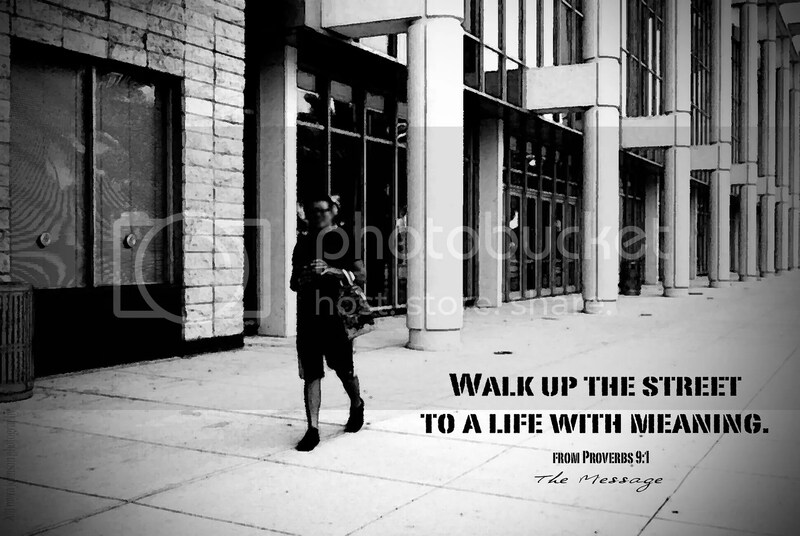 Walk up the street to a life with meaning." An interesting spider had made its web very close to my front porch. Having seen that kind before, I knew how stunning its markings were. I decided to photograph it. Afterwards, I walked around my yard. I found two other types of spiders near the porch, as well. While photographing the last spider, a dragonfly came to rest on an aloe vera plant near me. Turning my lens to him, I snapped a few shots. He would fly away, then return. It happened at least three times, giving me ample opportunity to explore the beauty of this remarkable creature. 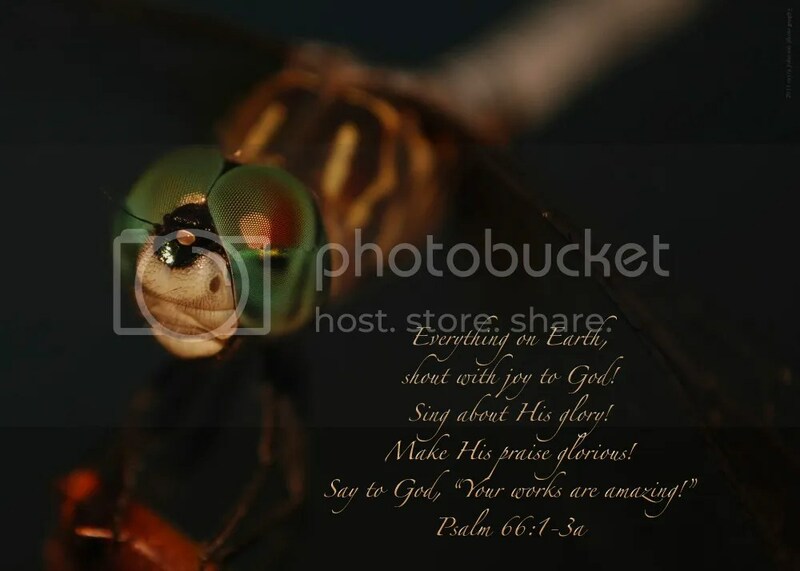 I hadn’t intended on photographing a dragonfly, yet God allowed me to witness His workmanship unexpectedly. Such magnificence darts around me daily in the form of a dragonfly…. 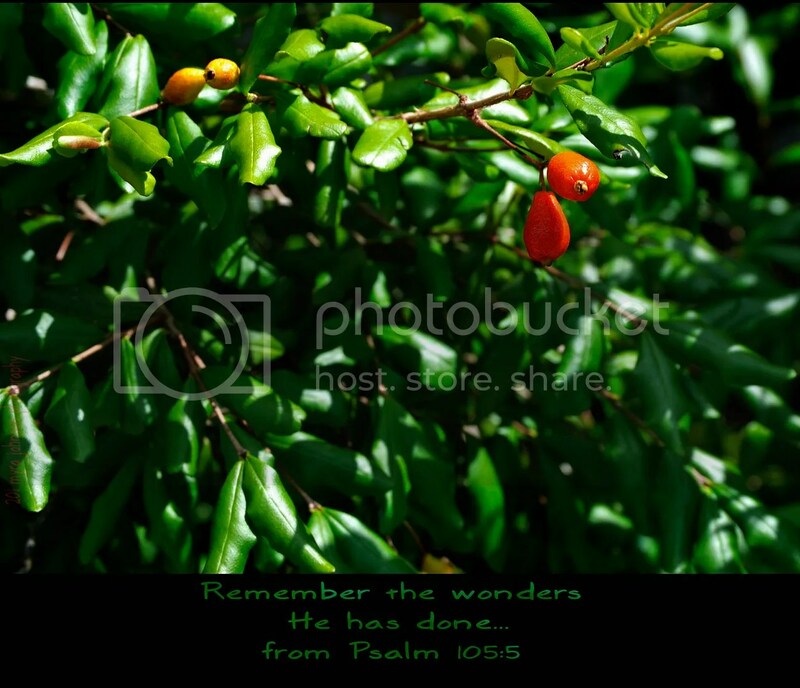 How amazing are the works of God! Everything on earth, shout with joy to God! Say to God, "Your works are amazing! your enemies fall before you. and sings praises to you. 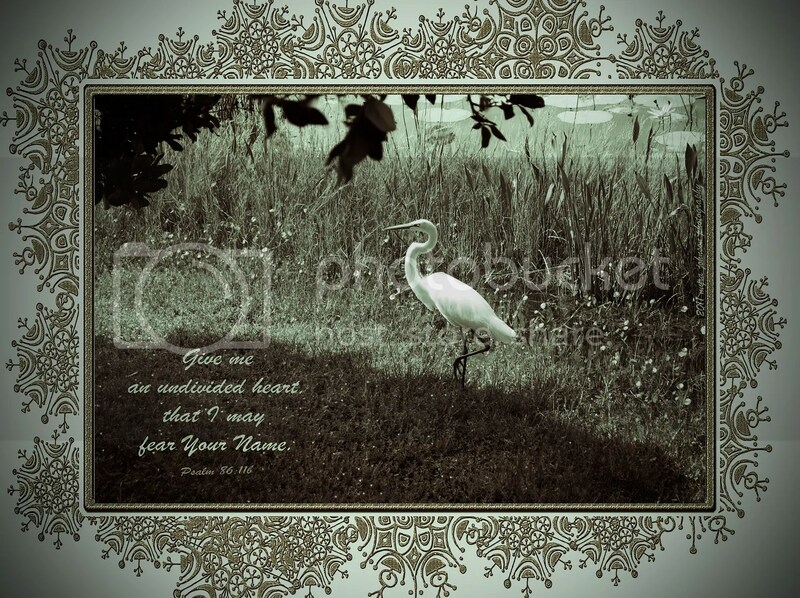 They sing praises to your name." Walking toward the bridge, I saw him. White as cotton, walking slowly near the water’s edge, eyes wide open. Such a graceful bird, uninhibited and free. Who has taught him to be so? God has created his kind and given them the mind to be what they were meant to be. They rely on God to provide for all their needs. Doesn’t God want us to be in relationship with Him? To be uninhibited by the things of this world and free to live for Him? 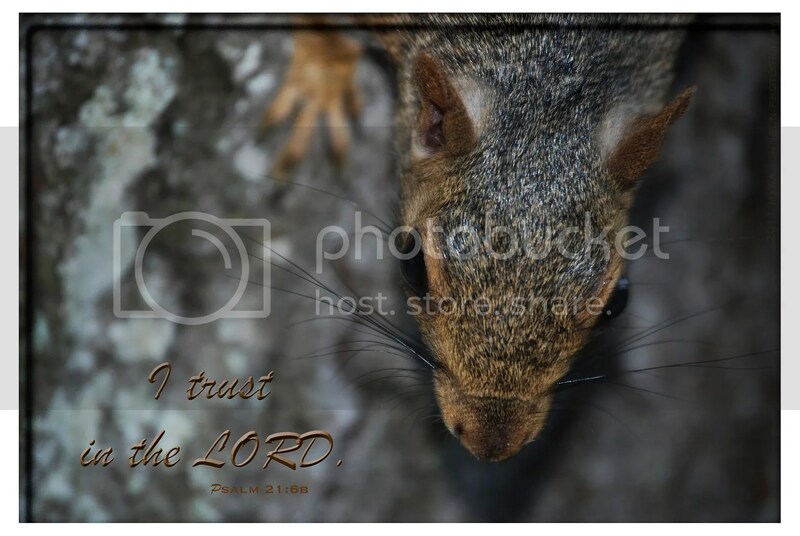 Free to rely on Him? 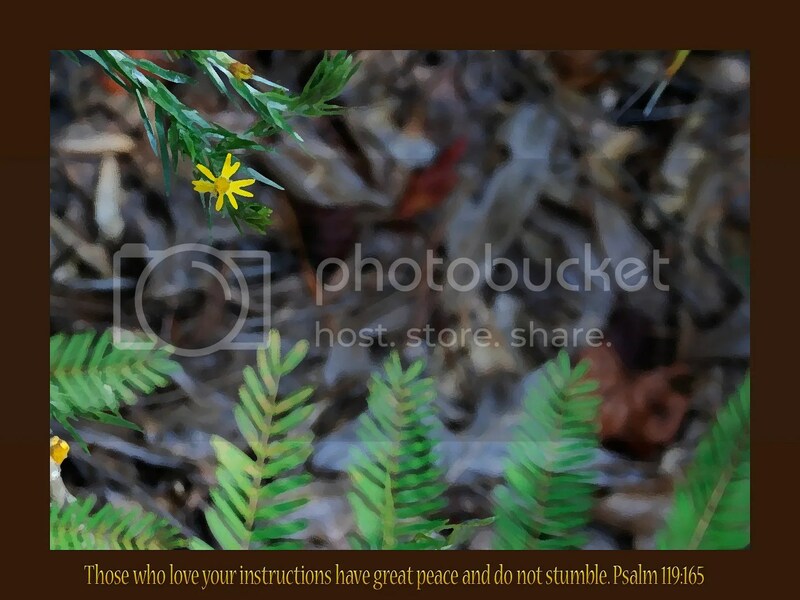 Free to praise Him with an undivided heart? For great is your love toward me;"
This afternoon, my husband and I were talking about all the good things that God had brought into our lives. So many blessings have been given to us. Time spent reflecting on what God has done is time well spent. Take a moment–right now–and think about God’s activity in your life. Who have you become because of it? The building was very stately looking. Complete with a tower, it’s unique characteristics were truly very interesting. As part of my job, I was attending a five day training seminar located in a large conference room there. While on lunch break, I decided to photograph some of the interior aspects of the structure. Having seen the tower from the road many times, I had never stood inside at its base looking upward—that is, until that day. 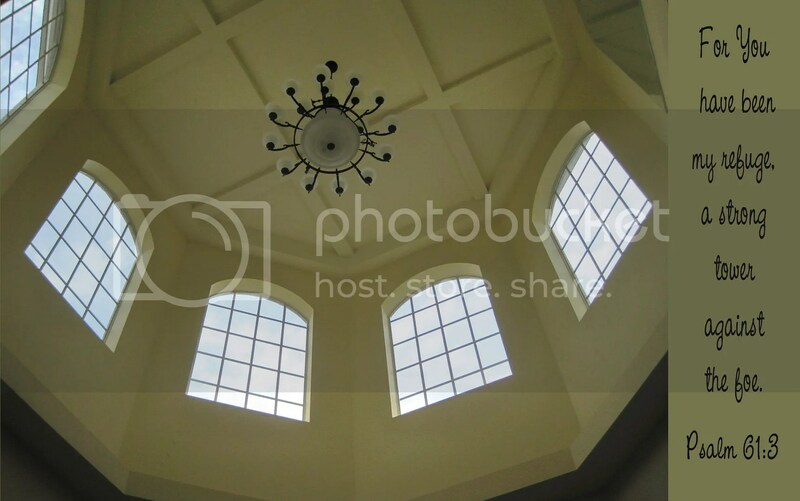 The windows encircling it framed the bright sky above. An ornate chandelier graced its center. If I could have stood beside the windows, my view would have been far reaching. The tower, however, was just for aesthetic purposes. No guard was placed within it to keep watch against an approaching foe in time of war. 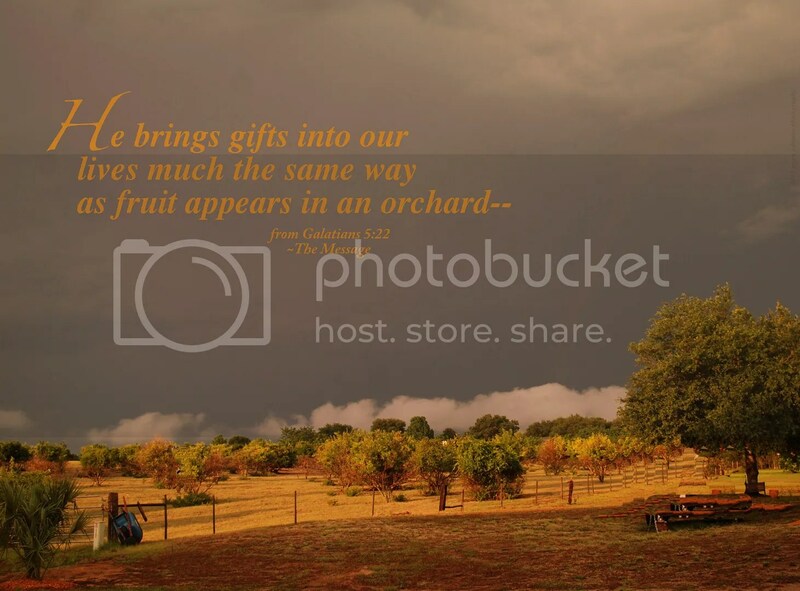 How does God see our lives? Doesn’t He keep watch over us with His complete and total view of what is approaching? He is our strong tower. While in a very large room at work, I happened to notice a very small ghecko crawling on the wall. I was immediately troubled, because I knew that for this little one, being in the room was a death sentence. Lack of water would eventually take over and he would probably be shriveled up in a corner somewhere without any hope in a very short time. Hurrying to get a container to trap him in, I returned to the area, only to find that he was gone. I crawled under a table near the place I had last seen him. This afternoon, I returned to the same room. I had totally forgotten about my young friend as I went about matters at hand. Walking in another area of the room, I suddenly saw him near the windows! Making a quick decision, I elected NOT to go and get a container. I would catch him with my bare hands. Let me pause for just a moment and ask you—how hard do you think it would be to catch a small, frightened ghecko with your hands? How difficult is it to juggle cubes of jello? Both questions belong in the same category…. 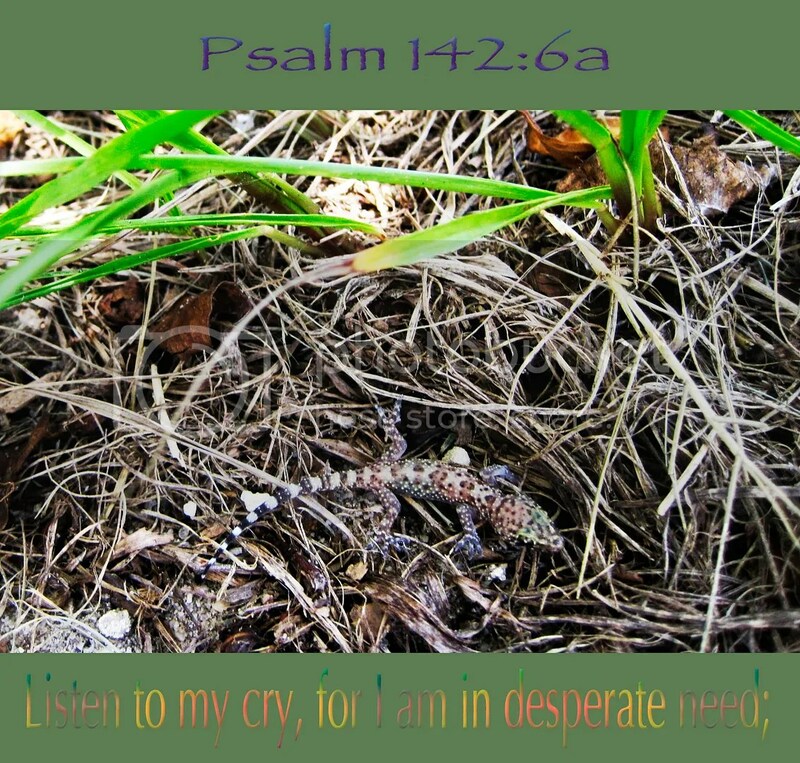 Knowing my limitations, I began to initiate the rescue, all the while praying. I asked God to allow me to save this creature. Within seconds, he was safely inside my two cupped hands. Walking out the door to the grass, I let him go, giving him back his freedom and his life. I knew then that I wanted to tell of this answered prayer. I walked back into the building to my office. I wanted to retrieve a camera and head back outside to make a post-rescue portrait. How long do you suppose a newly released ghecko would hang around in the same grassy spot he’d just been released to? Probably less time than it would take to give up on juggling jello…. God knew, however, that I wanted to share His faithfulness in this situation. By the time I returned to the area I had left my multi-colored buddy in, he was………still there. The ghecko was in desperate need. He had been without water for some time already. God allowed me to set him free from his prison–one that he had chosen himself out of ignorance to the danger. Whether he did or not, my own heart was grateful for it. God had heard my prayer on his behalf and granted my request. The donkey was calmly grazing in the field. He was not frightened in any visible way of my presence. He made no sound as he looked at me. 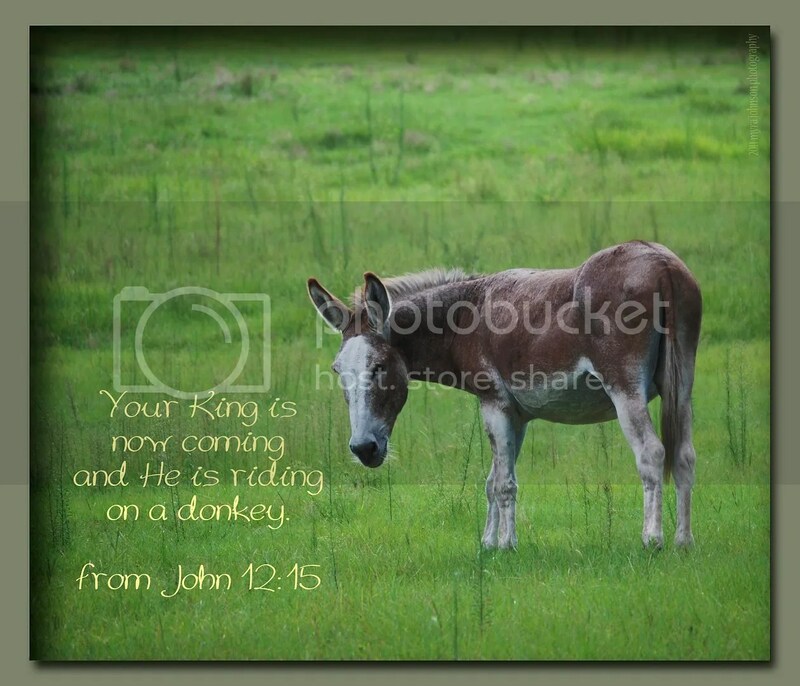 I wonder what it would’ve been like to have seen Jesus riding into the city on a donkey? I realize that poetry and lyrics can have many meanings. This afternoon, as I was unpacking a shipment of boxes at work, I began to actually contemplate the words I was hearing from the radio in the room. What if tonight is the very last night? What if the world as we know it should end and Jesus returns? If He did, those who have accepted Him previously as their Savior will go to be with Him forever. Those who have not accepted Him will be separated from Him–and us–for all eternity. If the singer is speaking to those who have not made the choice to trust in Jesus, then I believe he is saying that they are only "one choice" away from being a part of God’s family in Heaven—just one choice from being with Jesus–and us–forever, as a family. This not only landed in my heart; it hit hard when it did. Just a few weeks ago, I found out that a very close friend had been killed. We first met when we were twelve. He attended my wedding. Years later, he came to my mother’s funeral. We spoke at more than one high school reunion. Living in separate parts of the country, news had not reached me until now about his death. Several years ago, my friend and I spoke earnestly about my faith in God and salvation through Jesus. We talked for hours. Sadly, my dear, dear friend finally told me that he just felt that he had done nothing to deserve Hell…. Did he ever come to a place where he felt the need for forgiveness and salvation? I am not sure that I will ever know. On the day he died, he was one choice from forever; one choice from together–with God, and with me and all his other Christian friends. If you have never asked Jesus to be your Lord and Savior, please don’t delay. Please, please, step across the line–the line that separates you from God. 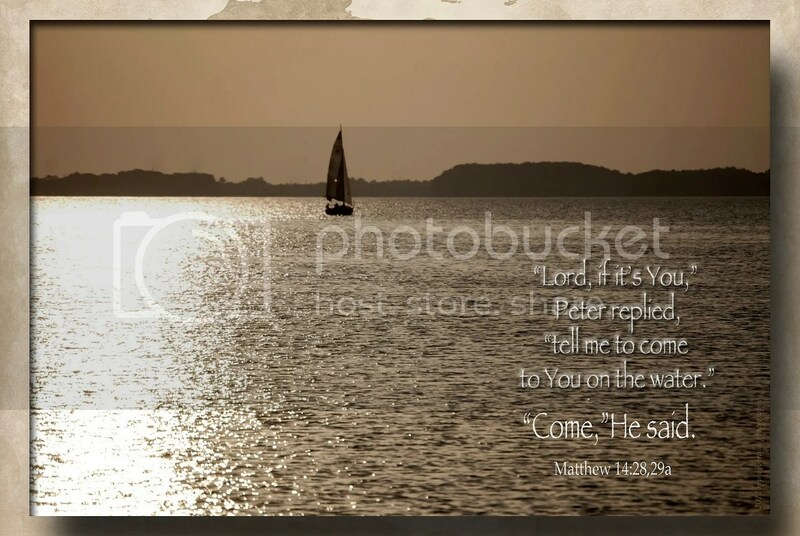 Sail across the sea with Jesus–ask Him to save you. You are one choice from forever, you……. My friend and I were driving in the rural community near her home. As we were traveling near a wooded lake area, she spotted two birds flying high above the trees. Pulling over, I got out of the car and walked toward them, listening to their high pitched, almost whistle-like voice. According to my friend, these birds visit only at a certain time of year. We had seen a mated pair and that was even more extraordinary! After arriving home, I read some information about them. Come to find out, they are listed as endangered in one state, threatened in another and rare in the state that borders my own. We were privileged to see them. Yet, we are privileged to know God and be loved by Him. It was going to be a four night stay at the hotel. The view from my window was relatively uninteresting, even from the 5th floor. Someone suggested that I travel up to a higher level where I could easily photograph a nearby church. Although I did not have an opportunity to visit the church or even know it’s name, the cross on the top of its pinnacle gave testimony to Jesus and what He did for us. The building itself was a fine example of architecture, majestic and detailed. The careful workmanship displayed in every aspect was evident. 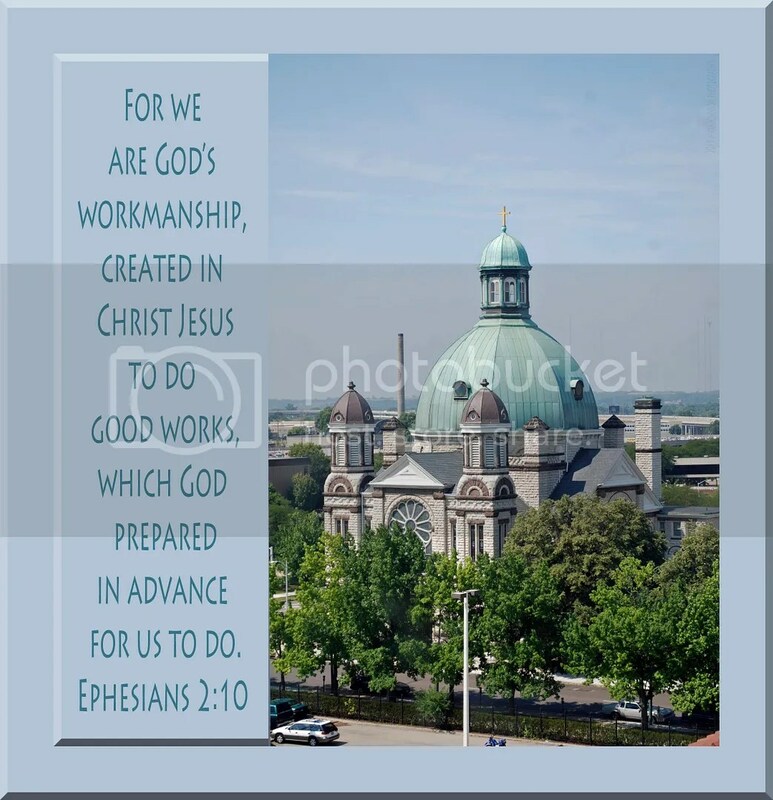 As God’s workmanship, do we give testimony of Jesus and what He has done for us? What is a miracle to you? Something that just could not ever happen, happening? Something that probably would never happen, happening? Without warning, a large, anonymous donation is made, just in time for the need. A co-worker who has always treated others with a terrible attitude one day changes to the personality of Mr. Scrooge on Christmas morning. Any of these would be a miracle in my mind, even more so if I had been praying directly about them. If I had been talking to God about healing an illness and He did, that would be a personal miracle. If I had been praying about a financial need and the funds were provided, that would be a personal miracle, as well. If I had been praying for the irritable, unruly person at work and found them one day to have become generous and kind, that would be a personal miracle, too. There are many miraculous occurrences in the Bible. Each one shows the mighty power of God. Is there an area in your life that is begging for a miracle? Does God really hear us when we pray? 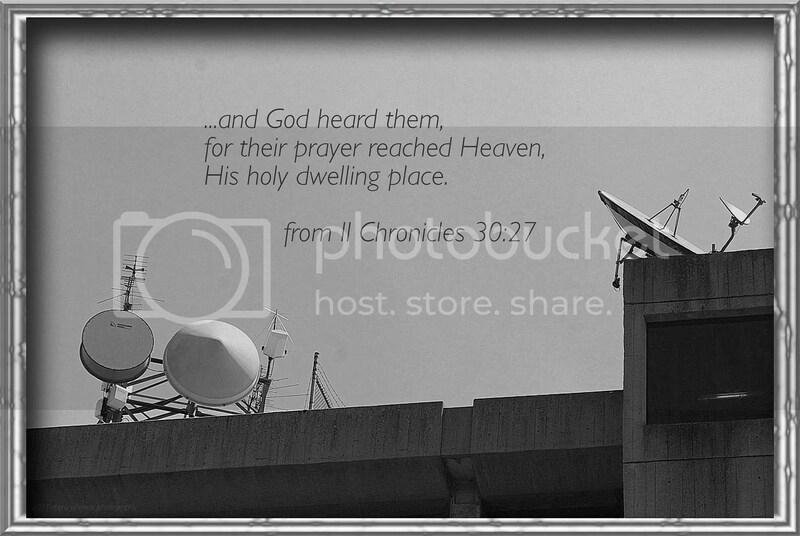 While walking downtown in a large city last month, I decided to photograph some rooftop communication devices. Perched high on a tall building, they sat silently. I could percieve nothing from them as they remained motionless, pointed at various spots in the sky. It is safe to assume, however, that they were busy about their business—transmitting words and sounds and images to countless numbers of people. Much technical advancement has gone into place in order for our current level of communication to be achieved and maintained. Now that we have it, we don’t want to do without it. But what do we need in order to communicate with God? Constructing a parabolic dish would not suffice. Wire antennas of varous lengths would do no good. An orbiting satellite far above the Earth? Can we actually communicate with the Maker of the universe? Over and over we see that men and women through the ages have prayed to their Father in Heaven. Over and over we see that God hears them. We don’t need sophisticated antennas to reach God. A heart that is yearning for fellowship with Him is what is needed. He takes care of all the rest. Once we know the precious fellowship of communication with God, we won’t want to do without it. 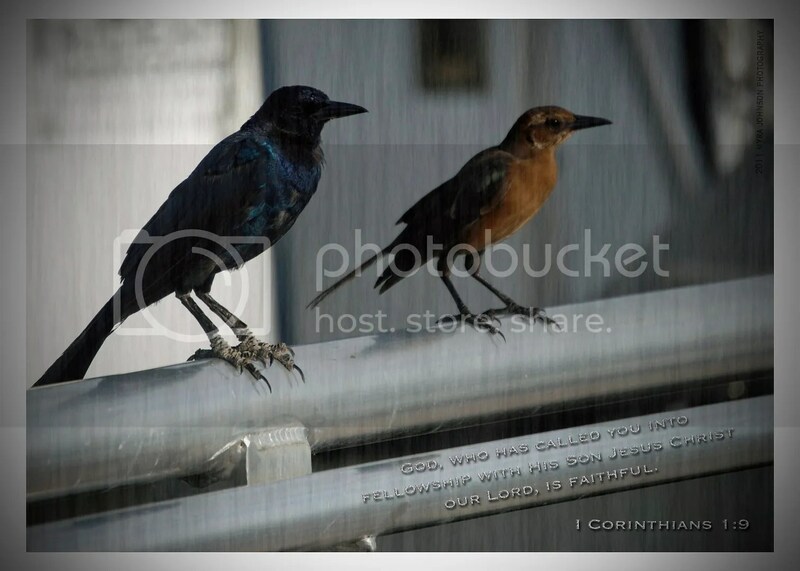 Two very different birds were sitting on a railing together. One had beautiful hues of blue accenting his black feathers. The other sported chocolate brown mixed with a creamy caramel color. Those questions fit nicely with an experience I had today…. As part of a training seminar at work, a story was shared. The main character seemed to be concerned about being the best. The problem was, who can define what that is? When he would hear positive comments about others, he would begin associating with that group and imitating them; after all, they must be really special. That would all work out fine, until he heard impressive comments about yet another group. He would soon decide to make more changes and imitate them instead. Maybe then he would be the best. This scenario was played out repeatedly. I’m not quite sure what the author had in mind, but it seemed to carry a powerful message. God has made us who we are. Seeking improvement in any area of our lives can be a good thing—that is if the improvement is God honoring. Trying to become someone for the praise of others is a futile trap that will rob us of valuable time and energy. Trying to fit in with a certain group by acting differently, making their habits ours or taking on their attitudes places us further away from our true selves. We are called into fellowship with Jesus. We have been admitted into a very special group of people–those who are forgiven. I’d say that is a VERY special group. It is the very BEST group possible, because it is made up of those who are redeemed. As part of the group, whom should we imitate? We continue to be just who God created us to be, yet we become imitators of Jesus. Blue and black feathers? No problem. Jesus made you that way. Chocolate and caramel brown feathers? No problem. Jesus made you that way. We have been called into His fellowship. His approval is all we will ever need. After work, I stopped at a store to purchase a few food items before going home. Traveling down the highway, something happened. I was driving straight ahead, when suddenly, it seemed as if the car moved over to the right. Being an experienced driver, I immediately thought, "Wind?" I glanced at the trees quickly to see if they were moving. If it was windy, they would be bending. There was a small amount of movement in the upper levels of the branches. As I came closer to my home, I passed a neighborhood community. New homes are currently being built there and tall, vertical flags used for advertisement are displayed at the front brick entryway. The flags were flapping vigorously in the wind. They confirmed what I had thought. There was quite a wind blowing. Enough to move a car…. Recently, I asked a very caring couple to pray with me about a concern that I had. A few days passed, then, one morning, I was made aware of what I felt was God’s movement in that concern. Many times, God is at work, but I don’t percieve it. Suddenly, I catch a glimpse of what He is doing. Looking more closely, I begin to see change—the wind is blowing in the treetops. there before me is an answered prayer, a miraculous work of God. The flags are beating in the wind, heralding His faithfulness and power in my life. The matter we had prayed about? 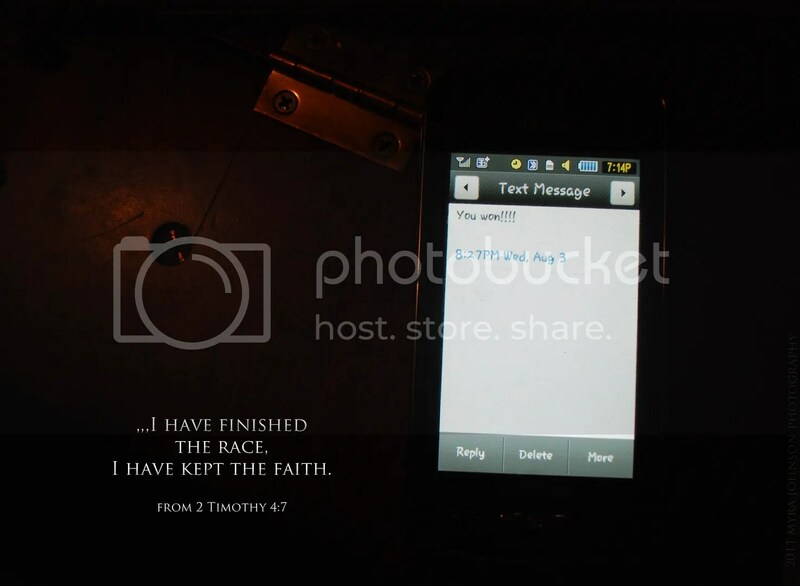 God is the only One who can resolve it, so He is who I should continue to talk to. the flags of answered prayer may be waving. Today was a perfect day to visit a park. The lakeside park was equipped with a water sprinkler play area for preschoolers. Tiny feet were everywhere as they ran cheerfully through the water with parents and family members looking on. There was a large gathering of people at one of the wooden pavilions. A birthday party? Maybe so. Others were out on the dock, fishing. Children were happily playing on a set of swings. An occasional boat would pass by. Through all of this, the squirrels were scampering everywhere. They didn’t mind having visitors. In fact, they seemed quite interested in them—at least, in me. I suspect that they give the same treatment to most anyone who stops to watch their antics. Being accustomed to humans walking the path around the park, they were not very afraid. In fact, it seemed that they trusted me somewhat. They were up close. Because of their trust, they got to take a closer look at me—and I got to take a closer look at them. Do you know someone who lives with fear? Perhaps they are actually afraid of God. Afraid to attend church when someone invites them. Afraid to read the Bible. There could be many reasons–guilt, shame, low self esteem–a general feeling of unworthiness; disappointments, unhealed hurts from the past. "What would God say to me?" or "I have to hide; I can’t face God. He doesn’t care, anyway" could be typical statements that show a lack of understanding and trust. The good news is, we don’t have to be afraid of God. He loves us and we can trust Him. Guilt? He can take care of that. Low self esteem? He can tell of His great love for you. Unworthiness? Because Jesus is worthy, we can come to God through Him. Disappointments? He can help you to frame the past in the light of His will. Unhealed hurts? He can comfort the brokenhearted. Since this and much, much more is true of God, why are there still those who run from Him? As believers, we can choose to encourage others to take a step closer to God–just a step–and see what happens. Gently, we can show the way to Him by living our own lives "up close." As we trust God more fully, we get a closer look at Him. Everything that Jesus did while on Earth was for a reason, don’t you think? Every miracle, every word of teaching, every compassionate glance of His eyes. Holding this to be true, why do you suppose that Jesus would orchestrate the events surrounding the night He chose to walk on water? Why did He go alone to pray? Why did He send His disciples on ahead in the boat? Why did He let them struggle in the storm for so long? Why did He walk to them, instead of just appearing into the boat? 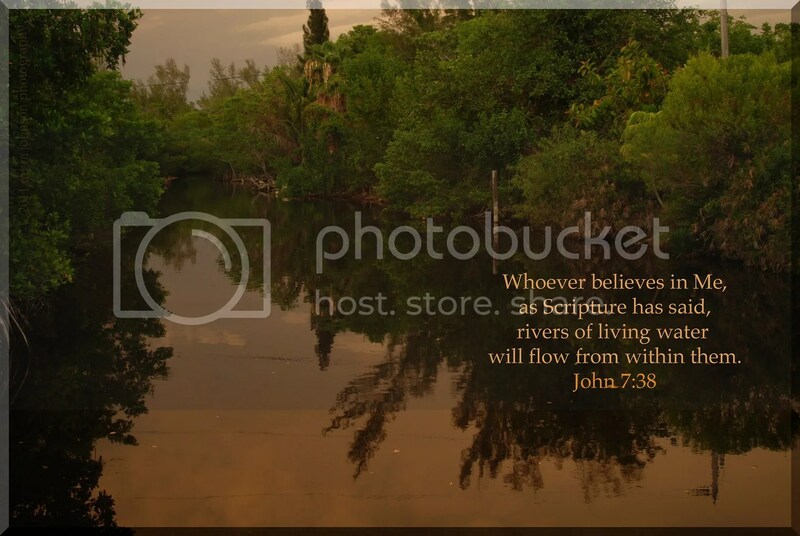 Why did He allow Peter to walk miraculously on the water, as well? Since all these things are recorded in scripture, they must be important for us to know about. Have you ever felt that you were alone in the storm without Jesus? Battling the raging sea all by yourself? You may have asked, "Why would He leave me in this solitary fight?" If this rings familiar, was there not also a time in the storm when Jesus joined you? A time when you felt His presence close by? You may have called out to Him and enjoyed a time of miraculous peace and trust as you walked toward Him, the relentless sounds of the waves and rain fading in its wake. But what happened then? Did you keep your eyes on Him or did your thoughts drift back to the crashing of the waters and the blinding flashes of lightning? Did you begin to "sink?" Even so, He didn’t leave you. Surely after this experience, Peter knew in his heart that with Jesus’ strength and power, anything was possible…. as long as he trusted completely, even in the midst of a storm. Jesus hears you calling to Him right now. Can you hear His reply? Have you ever felt that you were alone in the storm without Jesus? You were battling the raging sea all by yourself? You may have asked, "Why would He leave me in this solitary fight?" If this rings familiar, was there not also a time in the storm when Jesus joined you? A time whne you felt His presence close by? What happened then? Did you keep your eyes on Him or did your thoughts drift back to the crashing of the waters and the blinding flashes of lightning? Even so, He would not have left you. 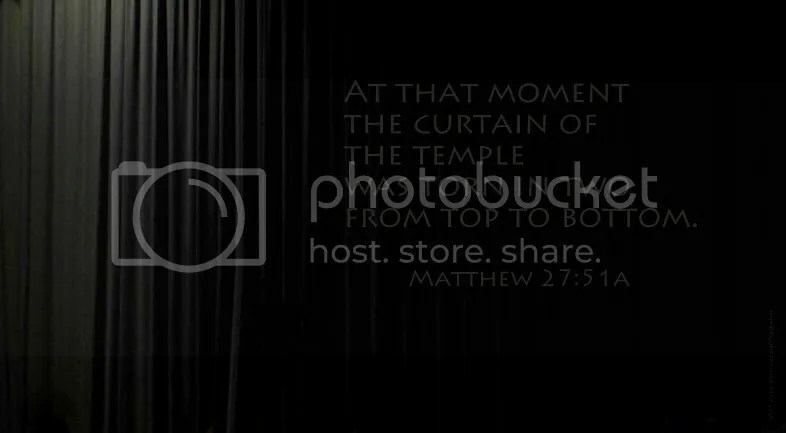 It was a very memorable service. 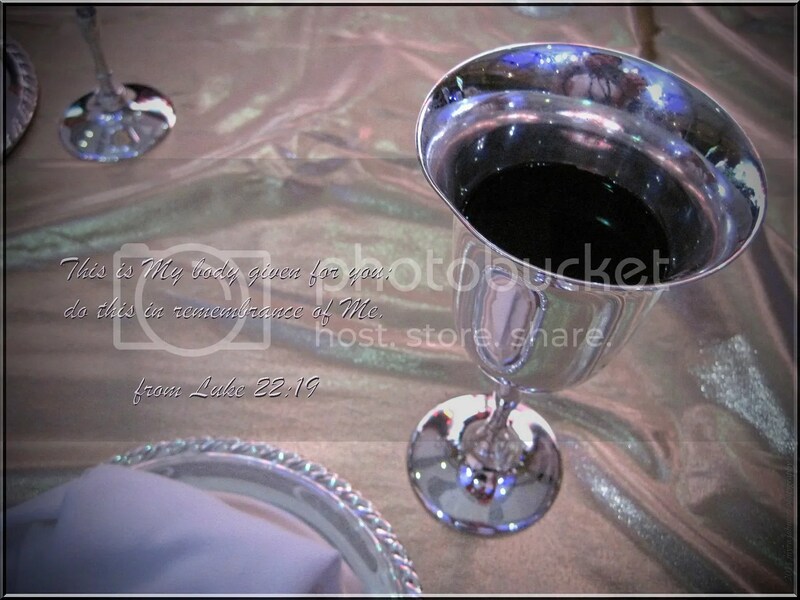 The communion table was set and scripture was read. Life given to us through Jesus. It was just a friendly game of Yahtzee. I was playing with several others at a large round table. Not being a very competitive person, I wasn’t really paying close attention to my score or to the success of the other players’ rolls. As the evening progressed, I decided that I would call it a night, even though I had only two turns left before the game was to end. I gave my score sheet to a friend that had joined us late and wasn’t playing. She agreed to play my last two turns. On my way home, I recieved a text message from a different friend at the table. The text read simply, "You won!!!!" When my scores were added— along with the last two that I hadn’t played personally—I had finished first. It was cause for a good laugh on my part. Today, I was thinking about it all in a different light, however. We live our lives growing closer to God as we invest ourselves into others. Think about it—year after year, haven’t you rocked babies, read Bible stories and prayed with your children until they were grown? Haven’t you listened as a friend shared their concerns and heartaches, urging them to trust in God? Haven’t you visited the sick in the hospital? Haven’t you been a witness for God at your workplace? You’ve probably not bothered to add up your "score." After all, we aren’t investing our lives in order to gain a ticket to Heaven; we are showing gratitude to God for all He has done for us and giving of ourselves to others because we care. As we invest in others, they will carry on the faith after we are gone. When we are no longer on this earth and in the presence of our heavenly Father, only then will we know the result of our efforts as God used them for His kingdom. Except for those alive when Jesus returns, we will all leave the game before it’s finished with a legacy of faith behind us. If you can detect some cautious reservation in this ficticious dialogue, you’re probably like me. At this point in my life, I have now flown on an airplane six times. Being really high up in the air has always been less favorable to me than being really low down on the ground. But I really did want to go…. The pilot began to speak to the passengers as we flew. We would be going through clouds. Clouds, I have learned, mean turbulance. Turbulance, I have learned, means a bumpy, up and down ride. I have also come to learn that in order to see clouds up close, one must BE up close. I was going to be seeing clouds. Like pillows of cotton, they floated to the side and below us. Drifting along in vast enormity, their presence drew my attention. Many times during the flight, I looked for comfort and protection from God as I prayed. He was there, always faithful, calming my concerns. 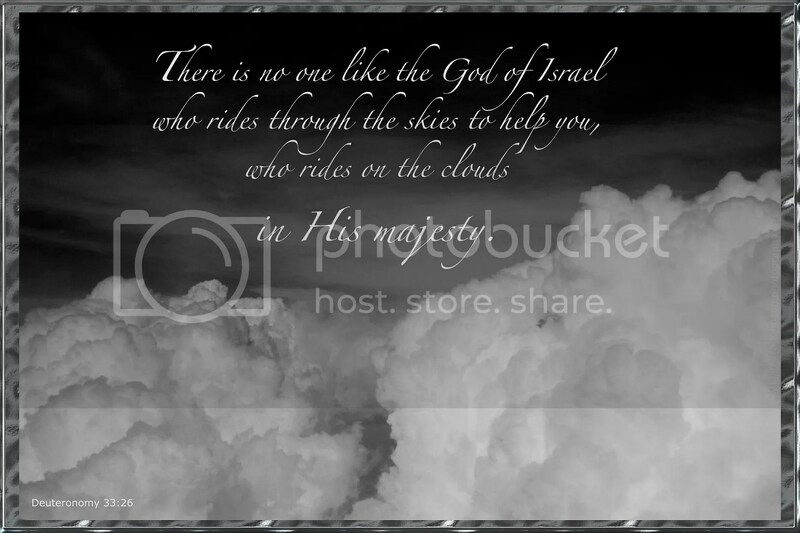 "There is no one like the God of Israel, who rides through the skies to help you, who rides on the clouds in His majesty." When I felt afraid, He truly rode "through the skies" to help me. 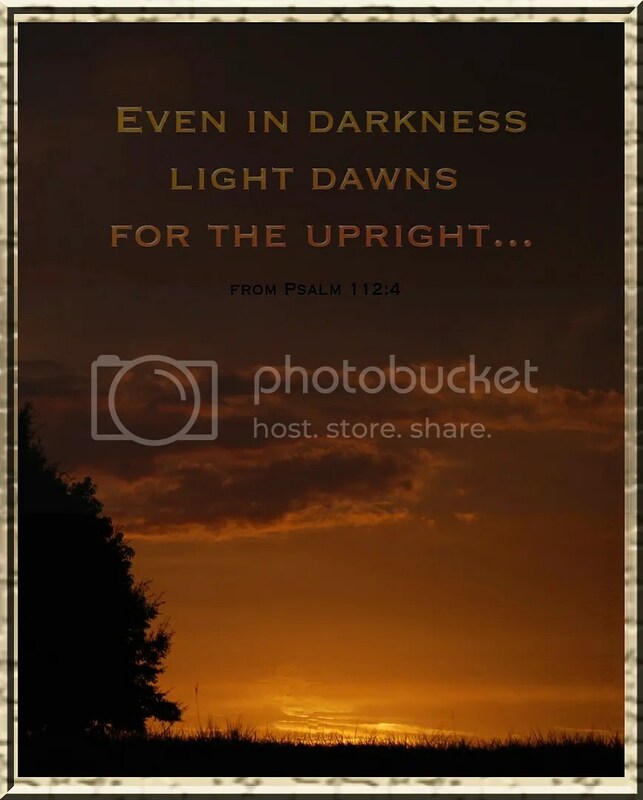 Remember—–He’s there to help you, too….